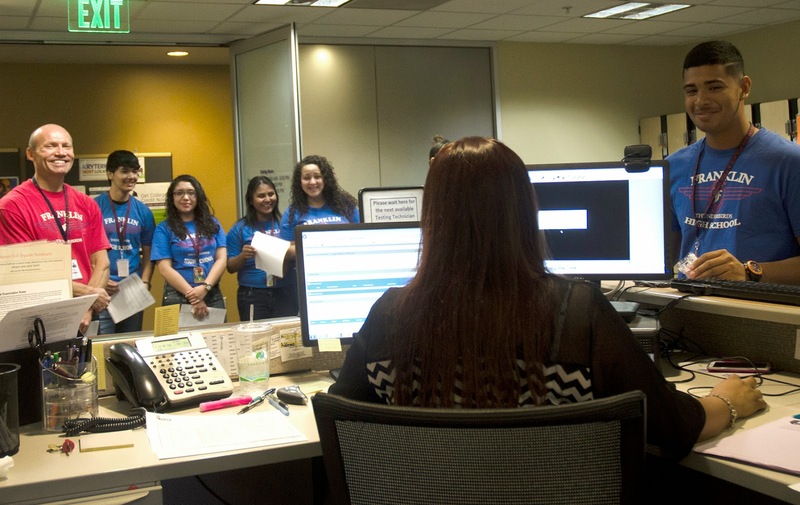 As an online college, Rio Salado doesn’t get the kind of foot traffic you see on most campuses so our curiosity was piqued a few weeks ago when a small school bus pulled up to the Tempe headquarters and dropped off nearly 20 Franklin Police and Fire High School students dressed in matching t-shirts. Accompanying the students was Steve Clendenen, Franklin’s Spanish teacher and world languages instructional leader, who provided some insight about their visit. 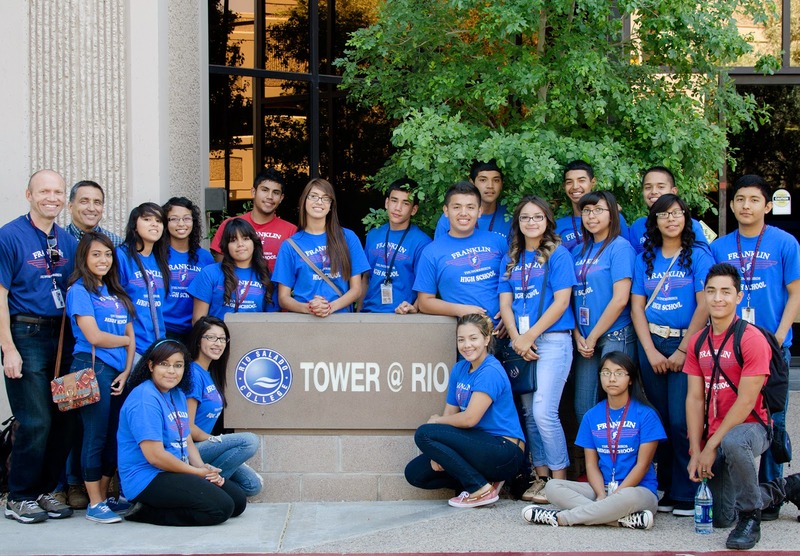 The students came to Rio Salado to take their College-Level Examination Program® (CLEP®) Spanish exam—one of 33 CLEP tests offered at the college. These exams assess subject matter proficiency and provide an opportunity for students to receive college credit with qualifying scores. Spanish CLEP test takers can earn up to 16 college credits. As the name suggests, Franklin Police and Fire High School, which is part of the Phoenix Union High School District, specializes in preparing students for careers in Law Enforcement, Firefighting and Emergency Medical Services. It is the first in the nation to offer a police and fire program within a four-year comprehensive high school program. All students are required to complete two years of Spanish, including communication skills that bilingual EMT and police officers often use in the field. While many of the Franklin students grew up in Spanish-speaking households, most were unfamiliar with the Castilian dialect they had to learn in class for the CLEP exam. “From day one I tell them that they will learn the universally accepted Spanish language, which is Castilian, so there is a transition period, especially when they’re freshman,” said Clendenen. Clenenden, who has been with Franklin for six years, arranged for 41 students to take the exam over the course of two days. He also helped the students organize fundraisers to help pay for the test. The students raised nearly $4,200 by hosting movie nights, car washes and selling refreshments. “I’m just very happy that every student was fully funded to take the test this year and the results speak for themselves,” said Clendenen. CLEP exams are one of several ways individuals can earn college credit for prior learning. Qualified candidates are also eligible to seek departmental credit by examination or evaluation. There are also a variety of other exams administered by Rio Salado testing centers across the Valley, including the GED® test and discounted CompTIA certification exams. For more details about credit for prior learning and testing services, visit www.riosalado.edu/testing or call 480-517-8560. This story can also be found in the July 12 edition of the Tempe Republic. By Annette Flores, manager of Rio Salado College media relations.